Caroline asked me for recommendations for sources of information to help her start a blog. We agreed that it would make a great project, and a topic for a series of blog posts. Here’s what we’ve covered over the last three months or so. Along the way we’ve created a small community as other people have been inspired to start blogging. We’re planning to turn the series into an ebook after the summer. Here’s Caroline’s final post in the series reflecting on what she’s learnt and where she plans to go from here. Looking back at my original objectives, I’m pleased to say that I’ve taken steps towards achieving them but also that there’s so much more to learn. When I casually asked Stephen if he could recommend some reading material I had no idea what we were about to start. He handed me a fantastic opportunity and I’m delighted to hear from others, both friends and strangers; that the process has inspired them to take up blogging too. I lead a pretty hectic life at times. I work full-time and in my spare time on freelance projects and in the last couple of months I’ve had some fairly big things happen in my personal life too. This can all equate to me putting a kind of unnecessary pressure on myself. Everything is progress, whether it’s a page full of scribbles written in my blogging notebook or simply reading other blogs, it all translates to learning and answering my objectives; be more creative, gain a better understanding of blogging, talk about blogging in a knowledgeable way. I’ve learnt about blogging platforms, writing content, analytics and social media but amongst all of that, I’ve learnt a lot about myself too. 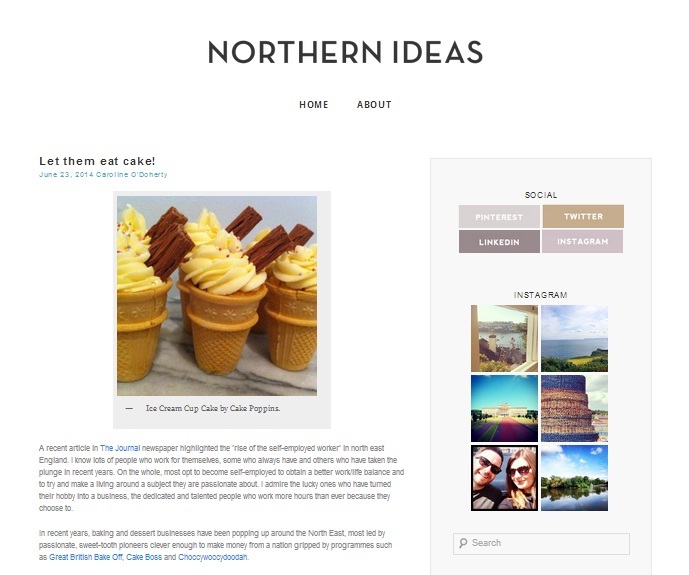 My blogging notebook is full of ideas although my new blog Northern Ideas has only two posts. Moving forward I’m scheduling more blogging time into my life. Professionally, I have strong self-discipline and I’m organised but I need to apply this approach so Northern Ideas is the end product instead of a notebook full of pages of wonderfully neat handwriting and beautiful doodles. Thanks to Stephen, I have gained a better understanding of blogging but the whole ethos of our project was to gain experience by doing, so that blog structure plan that’s not quite finished and those half written blogs that aren’t even in WordPress yet are next on my list. I’m reading more blogs and following more bloggers on social media than I ever did before. It’s a supportive and welcoming community. My advice to others would be to get involved, wade in, explore and see what it’s all about. Make time, plan, scribble, read, but most importantly, post. And when your offline world gets a bit demanding, don’t worry, the online world can pause. Soak everything up and remember that as long as you’re moving forward, you’re heading in the right direction. You can connect with Caroline on Twitter @codoherty or via her blog Northern Ideas.